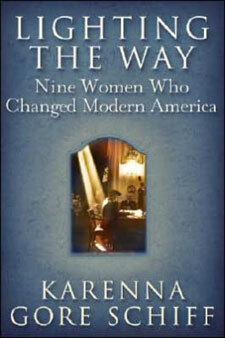 Karenna Gore Schiff is the author of "Lighting the Way: Nine Women Who Changed Modern America" (2006), a nonfiction narrative that tells the stories of nine unsung heroines of 20th century American history. The nine women include Ida B. Wells-Barnett, who was born a slave and fought against lynching; Mother Jones, an Irish immigrant who organized coal miners and campaigned against child labor; Alice Hamilton, who pushed for regulation of industrial toxins; Frances Perkins, who established our social security program; Virginia Durr, a high society Southern belle who fought the poll tax and segregation; Septima Clark, who helped register black voters; Dolores Huerta, who organized farm workers; Dr. Helen Rodriguez-Trias, an activist for reproductive rights; and Gretchen Buchenholz, currently one of the nation's leading child advocates. A graduate of Harvard University and Columbia Law School, the 32-year-old first-time author and mother of two is the eldest daughter of Al and Tipper Gore. She has worked as a news intern for WREG-TV in Memphis, and for the New Orleans "Times-Picayune." After graduating from Harvard she worked for a short time for the online magazine, "Slate." She also worked briefly for a law firm in New York. Gore Schiff reportedly served as one of her father's closest advisors during the 2000 presidential campaign, and delivered a moving tribute to him at the Democratic National Convention in Los Angeles. She currently serves as Director of Community Affairs for the Association to Benefit Children (ABC), a New York City not-for-profit organization that serves disadvantaged communities. ABC provides early childhood education, health care services, housing assistance, mental health services, family preservation, crisis intervention, recreational services, job training and employment assistance, therapeutic after school and summer day camp programs, mentoring and legal advocacy.